The success of Parker’s “51” led to a legion of imitators, some more respectable than others. 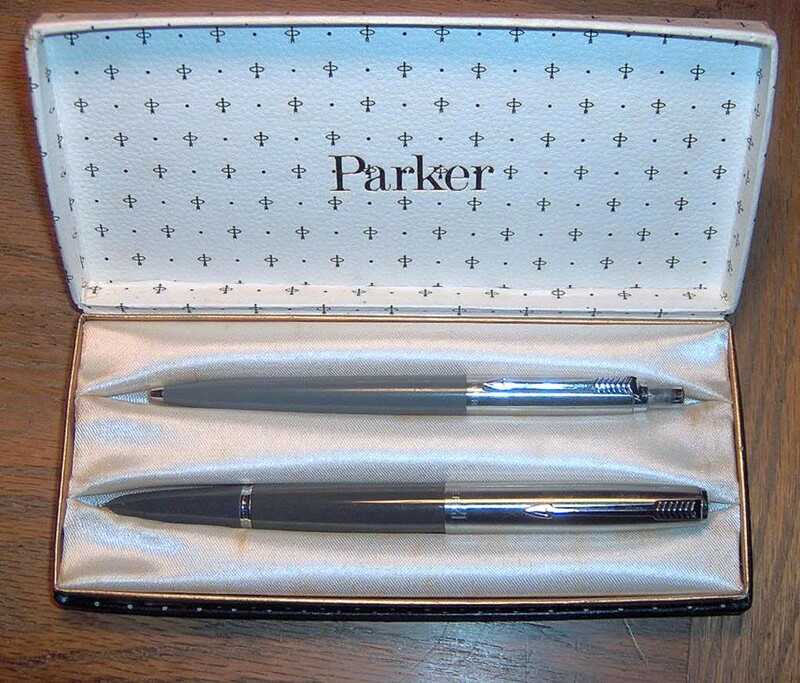 By 1948, Parker was starting to feel left out of the market of low-end pens that looked rather like the “51”, and so introduced the “21”. Like the majority of the non-Parker imitators, the inner-workings of the “21” are really nothing at all like the complicated flow-control gizmos of the big brother pen. There are three main sorts of “21” in the world. The earliest, dubbed by collectors the Mark I, is the least Parkerish and more generic, with a simple ridged clip. Many of these will still have visible body impressions with date codes, too. The Mark II has no impression on the barrel and a distinctive clip; it’s a relatively simple stamped item with a v-shaped cross-section, it is surprisingly efficient while also safe for the pocket it rests in. It appeared in about 1951, and offered a slightly better feed design. Both the Mk.I and Mk. II look quite unlike the “51” at the business end, as the opening at the front of the hood is much larger. The third type of “21” appeared in 1956: the Super “21”. This pen is very similar to the “51”, as the aforementioned gizmos do actually appear inside it, so the front of the hood is all but identical to the more expensive pen, and the clutch-ring is essentially the same as well. 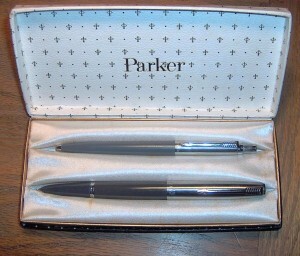 Without looking at the filler, the only evident difference between the two models of pen is the clip, which was initially much the same as that on the Mk. I but which changed to the habitual Parker stylized arrow. This specific stylization is the same style that would also appear on the Parker 45. The introduction of the 45 was in fact the final nail in the coffin of the “21”, as the combination of higher price, less up-to-date styling and lack of cartridge convenience drove buyers to give up on it. There were, as it happens, several nails already there, as the earlier “21”s shared the somewhat flimsy and crack-prone plastic of the 61. This seems to have been sorted out by the time the Super “21” appeared, as the catalogue for 1957 is at pains to draw attention to the superior X-100 plastic (! ), but a reputation is a difficult thing to undo. The writing of the “21”s is in all incarnations extremely good. The Super is in essence a “51” Special in a lesser body (X-100 is still not Lucite), while the earlier merely mortal versions had a large, rather traditional point of a highly finished sort. If you find yourself looking at one with an eye towards purchasing, look very carefully at the hood, as this is the site of the most fatal cracks; body cracks can be more easily dealt or lived with. Cost When New: Initially $5.00. The Mk. II and the Super were $5.75 (for modern values, try this calculator). Size: 13.3 cm long capped, 14.5 cm posted, 12.2 cm uncapped. Point: Steel (a specific eight-component alloy used by Parker called “Octanium”, which like X-100 is a name invented in the promotions department). Body: Polystyrene, at least in the first two versions; I’m not sure what X-100 is when it’s not hiding behind ad-man puffery. There was a steel-bodied version of the Super. This is the big anatomical difference between the earlier versions and the Super – a much bigger intake and visible feed. Parker Super “21” – it’s very nearly a “51” Special. Notice the difference between this later clip and the earlier one. The clip changed before the clutch, so don’t rely entirely on it to tell you whether the pen is older or newer– check the clutch as well. My Super “21” came to me in a set with a Jotter… which I suspect is an aftermarket composition.